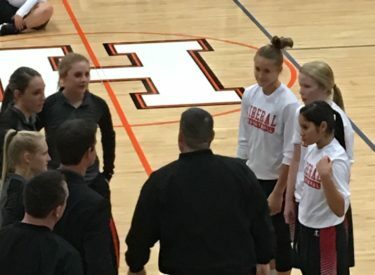 Liberal won their opener for a third consecutive season Friday night in Holcomb. LHS defeated the Lady Longhorns of Holcomb 55-40 in a game they led by as many as 20. After the game LHS head coach Carter Kruger says he was pleased with his teams’ effort and defense and says they have a long way to go on offense. The Lady Redskins led 12-10 after one quarter and 33-23 at the half. LHS led 46-29 after three quarters. Machia Mullens paced Liberal with 16 points and was 10-11 of the foul line. Katie Horyna had 14 and Ali Lucero scored 12. Liberal forced 18 Holcomb turnovers. Liberal is 1-0 and plays at Guymon Tuesday night at 6:30 on 1270 and kscbnews.net.